"You can't realise your dreams unless you have one to begin with. My desire is to do everything within my power to free people from drudgery and create the largest measure of happiness and prosperity." The beauty of the genius of Thomas Edison lay on his ability to masterfully combine imagination, vision and real impact. He is hailed as one of the greatest scientific minds of all times, a futurist and successful businessman. Edison was a restless spirit since childhood, and none of the many adversities that came upon his path could halt the evolution of his creativity and thirst for achievement. He was a dyslexic, almost deaf since he was a young boy, and only received three months of formal education before he was requested to leave school at the age of seven due to his hyperactive behavior. His mother was the one that persisted to believe in his intelligence and attended to his home education. Edison used to lovingly confess that: "My mother was the making of me. She was so true, so sure of me. And I felt I had something to live for, someone I must not disappoint." After that point, a whole new world opened for the young boy and he became a passionate reader of world history, English literature, poetry and the works of the great Isaac Newton. Later on, he contemplated that: "The most necessary task of civilization is to teach people how to think. The trouble with our way of educating is that it does not give elasticity to the mind. It casts the brain into a mold. It does not encourage original thought or reasoning, and it lays more stress on memory than observation." From the explosions caused by crazy chemical experimentations at his parents' basement, to the world's first R&D lab which became reality in 1876. 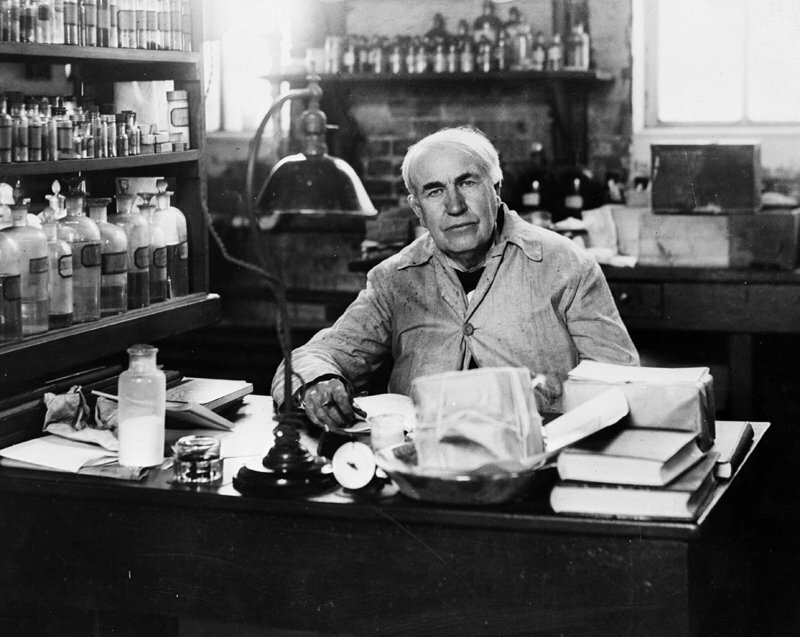 Thomas Edison would continually create in Menlo Park at what he called his 'invention factory'. His talented team came from all over the globe, as Edison soon became known as the Wizard of Menlo Park. Throughout his lifetime, a wealth of ideas were turned into reality. He patented 1,093 inventions, including the phonograph, the motion picture camera and of course, his most famous invention, the practical electric light bulb. His greatest accomplishment was the world's first central power station and in 1882, his big dream to illuminate our lives was realised - starting in the streets of Manhattan. 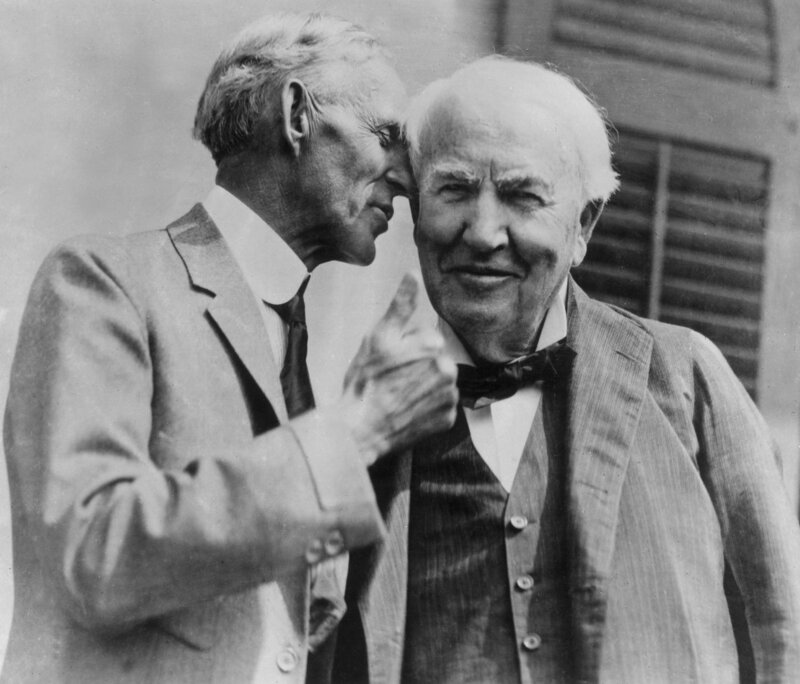 Edison [below with Henry Ford] was not an out of this world inventor, but a systematic thinker and a grounded businessman that was driven by real life necessities, as well as the ongoing needs of society for innovation and betterment. His vision was focused and clear-cut: "Anything that will not sell, I do not want to invent. Its sale is proof of utility, and utility is success." He was a serial entrepreneur and had a diversified portfolio of companies, ranging from electric lighting systems, battery supplies, manufacturing, cement products, mining, and motion pictures. His most successful business venture was the Edison Illuminating Company, which following a merger led by financier J.P. Morgan became the world-known General Electric. "The three great essentials to achieve anything worthwhile, are first hard-work; second, stick-to-itiveness, third, common sense." This is one of Edison's sayings that reveals the core of his personal philosophy and business strategy. Concrete methodology and a never ending persistence were the virtues of the prolific inventor and the keys that unlocked numerous opportunities for success. He knew the importance of combining diversified knowledge and expertise, and selected his closest associates based on these criteria. Indeed, Edison had discovered the power of creating and managing a think-tank for intelligent minds to thrive together. Edison did not just add his genius inventions to the collective wealth of the world, but his futuristic ideas lay the ground to influence the vision of modern day innovators and shaped the future. It was Edison that dreamed of electric cars and envisioned a world powered by solar and wind energy. During his latest years, his mind still fueled by endless ideas, pondered: "Someday, man will harness the rise and fall of the tides, imprison the power of the sun, and release atomic power." Great minds come together and true companionship is a treasure for life. 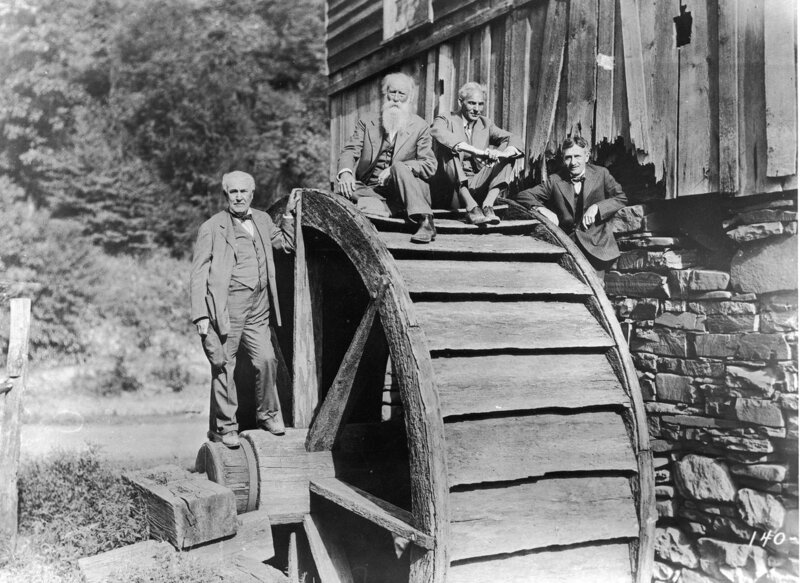 Thomas Edison, Henry Ford, Harvey Firestone, and the renowned naturalist, John Burroughs were the self-proclaimed Vagabonds. And what better setting for the lifelong friends to share their dreams and invigorate their visions than escapes to nature. Inspiration comes in unexpected ways, and these successful men proved to be avid adventures and seekers of the road less traveled. Their restless spirit lead them to explorations from Pennsylvania to Tennessee through the Great Smoky Mountains, the Appalachians, California, and the remote Everglades. Almost every year, they embarked together on lengthy camping trips, navigating through unknown destinations, setting up challenges, listening to Edison's tall-tales and delving into discussions about Mozart and Shakespeare. One can only imagine the Vagabonds' days of adventures. Gathered around campfires under the stars of those nights, their inspirational discussions included the following thoughts.